What is a Natural zone of Ecological Interest, Fauna and Flora ? A Natural Zone of ecological interest, fauna and flora (ZNIEFF) is a type of natural environment recognized by France. An inventory of ZNIEFF area is an inventory of natural resources and scientific program launched in 1982 by Minister of Environment. Type II : big area that has great rich natural interest, or slightly modified, which offers important biological potential. What are the characteritics of the Natural zone of Ecological Interest, Fauna and Flora of the Vigueirat Marshes ? 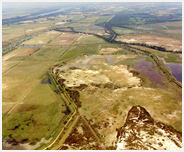 The Vigueirat Marshes are part of the ZNIEFF Type I Dépression du Vigueirat – Marais des Costières de Crau (13-100-152). This ZNIEFF, described in 1988, covers 3478,14 hectares, streches on the county of Arles and Port-Saint-Louis-du-Rhône. This area is located East of the Grand Rhône, between the Arles to Bouc Canal ans the stony desert-like Crau. This ZNIEFF has several peculiarities about flora and habitats. Indeed, East of the Vigueirat Canal, there are “laurons” (depressions fed by groundwater of the Crau) housing an original floral diversity. Between the Vigueirat Canal and Arles to Bouc Canal (encompassing the Vigueirat Marshes), the vegetation is closer to those found in the Camargue (brackish marshes, salt marshes, etc.). It also identifies large areas of reedbeds, preferred habitat for birds. Regarding the fauna, there have been decisive in this area sixteen species and twenty two remarkable species : Pond terrapin, white stork, greylag goose, red-crested pochard, squacco heron, Eurasian bittern, Purple Heron, etc.